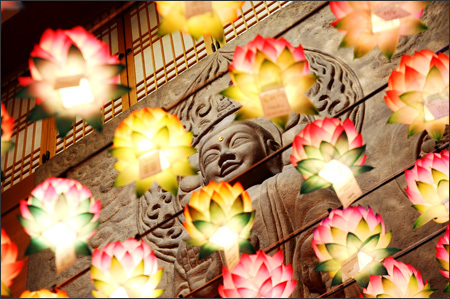 There is a Buddhist saying that goes: “Please attain Buddhism in your next lifetime by lighting a lantern in this life.” The saying is being realized by many Buddhists this May, as they visit temples scattered around Korea to light lotus lanterns and celebrate Buddha’s Birthday. Buddha’s Birthday is celebrated annually on the eighth day of the fourth lunar month ― May 21 this year ― and the Jogye Order of Korean Buddhism is gearing up for its annual Lotus Lantern Festival, or the Yeondeunghoe. Within the Buddhist religion, Buddha’s Birthday is the biggest holiday among other events.